I lived in Singapore for four years during the late 70’s as a 747 pilot. One of my fondest memories was eating Singapore Chili Crab at one of the many hawker food stalls dotting the island. The spicy and pungent crab sauce coupled with the sweltering tropical heat made eating it a sweaty and intoxicating experience. The more you ate, the more your tongue felt like it was on fire but you couldn’t stop yourself. The antidote was to pair it with hot Indian tea made with fresh cow’s milk. The froth was made by an acrobatic maneuver of pouring hot tea from one arm stretched over the barista’s shoulders into the cup held in the other hand almost at the barista’s knee. The higher the barista could drop the tea, the frothier the tea. After 2-3 “drops”, your tea would reach frothy perfection with about ½ inch of froth like a good lager beer. You could savor the bits of coagulated bovine albumin fat from the fresh milk that would slide past the tip of your tongue as you took little sips to douse the flames from the chili crab. I’ve been a friend and fan of Meathead’s Amazingribs.com since I started competing in BBQ in 2008. After my airline career was sidelined by the oil crisis in the 1980’s, I ended up retraining for a new computer career at Texas Tech U in the mid-1980’s. In 2008, I made my first foray into competition BBQ after a co-worker suggested I enter a contest after being inspired by the 2008 movie The Bucket List starring Jack Nicholson and Morgan Freemen. Long story short, in four years, I’ve become one of the top-ranked BBQ pitmasters in America having won 20+ grand championships, California and Arizona Team of the Year, and numerous national awards. Meathead suggested I share some of my favorite burger recipes for Independence Day. I suggested Singapore Chili Crab. When he told me he was allergic to crabs, shrimps, and lobster, but still wanted to share sea bug recipes with his readers, I gladly offered . 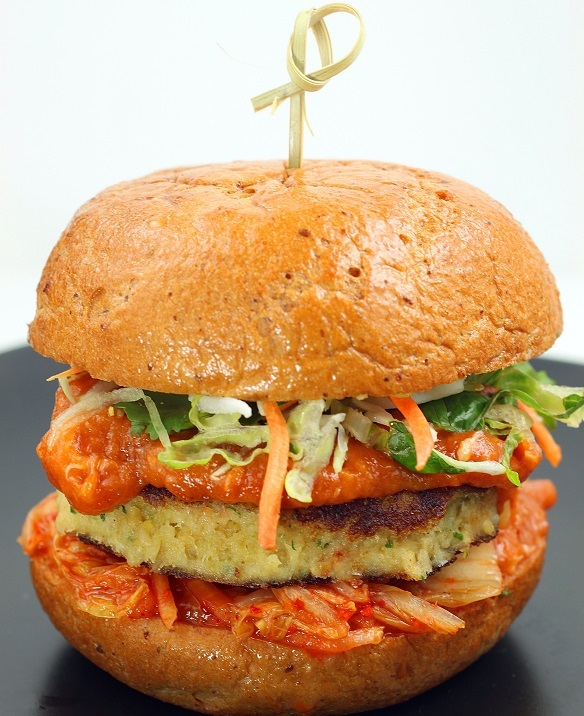 .. .
My Singapore Chili Crab burger is pretty easy to make. If you like to take a shortcut, you could even buy ready-made crab cakes and jazz them up a bit using my recipe as a guideline. For the purist, you can boil your freshly hand-caught free-range no-hormone crab and pick out all the meat! Or you can be lazy like me and get a tin of some good quality crab meat. Combine crab patty ingredients except crab, SYD Hot rub, and breadcrumbs. Add crab and mix gently. Gently fold in the breadcrumbs without breaking up the crab. Shape each crab portion with your hands into a round patty about the diameter of your bun. Sprinkle with some SYD Hot rub on both sides and place on wax paper lined cookie sheet. Cover with plastic wrap and chill in fridge for at least an hour or until ready to cook. You can cook the patties on the grill or on a hot sauté pan. Grill Method – For the grill method, heat up your grill to 400°F or perform the hand test. The test is a measure of how long you can hold your hand 6 inches above the grill before withdrawing your hand. 3-4 seconds is equivalent to about 400°F. Clean your grates with a wire brush and then apply some cooking oil on the grates with a rag dipped in cooking oil. Grates must be clean and oiled else patties will stick. Further, ensure your patties are very cold so they don’t come apart while on the grill. Spray some non-stick oil/butter on your patties before you put them onto the hot grill. Close the grill cover, and wait until they develop a nice char (about 4 minutes). After about 4 minutes, flip over and repeat to get a nice char on the other side. Pan Method – Remove crab patties from fridge and pan fry with some non-stick spray. When done, remove patties, and use the hot pan to toast the insides of your buns. 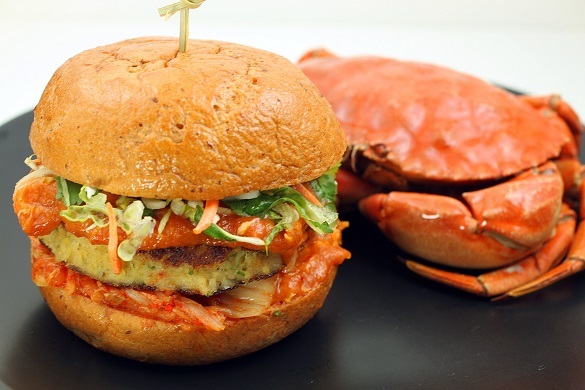 Spread some spicy crab sauce on your buns, add one layer of Kim Chee pickled cabbage on the bottom half to cover the bun, add your crab patty, add more spicy crab sauce, top with napa and carrot, more spicy crab sauce, and the top half of your bun. Enjoy immediately with frothy Indian tea or your favorite beer. Tsingtao Asian beer makes a good pairing.